Keeping at the forefront of technological advances in construction is how intelligent clients and designers are maximising construction outputs and increasing profit margins. The need for rapid construction of quality buildings means that increasingly, engineers and architects are turning to innovative materials that are easy to construct and provide superior performance in order to build as efficiently as possible. One of these materials is Cold Formed Steel (CFS), which is quickly gaining popularity globally as the structural material of choice. Used in both US and UK construction since the 1850s, CFS truss systems are replacing timber trusses in countries such as China and South East Asia for cost-effective homes, in Africa and the Middle East where quality timber and skilled labour are in short supply, and in Australia and New Zealand where the durability and ease of design is valued. Should you use CFS roof trusses? Every project is unique and has different aims, but in general, the case for choosing steel roof trusses is a compelling one. These are just a few of the reasons why this material is worth considering. CFS trusses offer all the flexibility of wood trusses, but are lighter and provide enhanced durability, faster and easier construction, and reduced waste. Design costs are minimised as the layout can be designed quickly with the help of engineering software programs, which also offer increased design flexibility for any desired shape or spatial layout. Pre-designed, pre-engineered trusses mean the building shell can be constructed easily and quickly, and pre-fabrication is also an option. Each component is delivered in its exact dimensions, saving time and reducing waste. Another benefit is the cost savings to be gained by using CFS roof trusses. Because of their non-combustibility, safety measures such as sprinklers can be omitted from a project. On a 52,000 sq. ft. office building in Texas, this saved the owner US$40,000 alone. In addition, the contractor estimated that 5-6 weeks of building time was saved by using CFS trusses, resulting in a 40% saving on labour costs. Complex roof geometries and roof profiles can all be accommodated with a steel roof truss system. 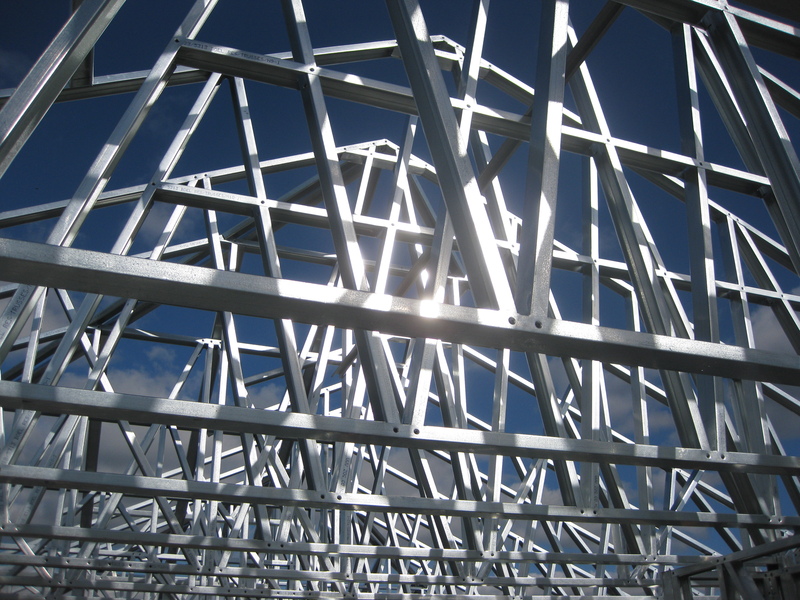 The infinite combination of profiles, depths, and web patterns on offer makes CFS trusses the most versatile and efficient framing system available. Bearing issues and complicated rooflines in mid-rise and multi-storey structures can be resolved using modelling software that also fabricates each component with absolute precision. CFS metal roof trusses can be seamlessly integrated with other support systems and materials using specially engineered connections. Most trusses are designed and manufactured as either an inline truss or a back-to-back truss, which are also available when using CFS. CFS inline trusses are easy to manufacture and transport, are easier to install and don’t require bracing during erection, unlike back-to-back trusses. However, CFS back-to-back trusses are faster to produce than inline and use less material, while also offering larger spans. Steel roof trusses offer considerable advantages over timber trusses in terms of longevity, ease of installation, and economy. This proven, versatile material is how designers and contractors are modernising their building methods while delighting clients with faster completion times at a reduced cost. When combined with a complete, end-to-end process provided by experts in the field, your design and construction capabilities will be transformed by using steel roof truss systems. If you would like to learn more about metal roof trusses, download our guide to the Benefits of using Cold Formed Steel roof trusses for an in-depth look at the advantages of using cold formed steel.